From picture-book genius John Burningham comes a whimsical new story about home, hope, and the convivial wisdom of children. Every night, a family — a mom, dad, boy, and girl — have supper and go to bed. But they’re not alone. Every night, after that family is asleep, a secret mouse family emerges to find food for their supper, and the mouse children start to play. Then one night it happens: the boy spots a mouse, and his father calls the mouse catcher. Concerned, the children write a note to the mice (“your lives are in danger”), and the mouse family flees to the backyard, where the boy and girl leave tiny swings and a trampoline they’ve made for the mice to play on. But as winter approaches and the children no longer see the mice frolicking outside in the evenings, they start to wonder. Where could the mice have gone? John Burningham is one of world’s most recognized and beloved illustrators. His work has received countless awards, including a Boston Globe–Horn Book Honor for It’s a Secret! and two Kate Greenaway Medals. Over his fifty-year career, John Burningham has written and illustrated more than thirty picture books, including Borka, Picnic, and Motor Miles. He is married to illustrator Helen Oxenbury. They have three children and live in North London. 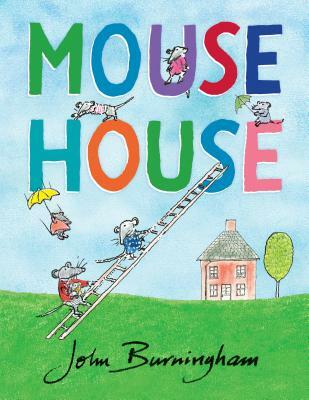 Perfectly rendered in every way, Mouse House is an awesome, fun tribute to kindness and friendship and is certain to have kids smiling on every page. —Kendal Rautzhan's "Books to Borrow"